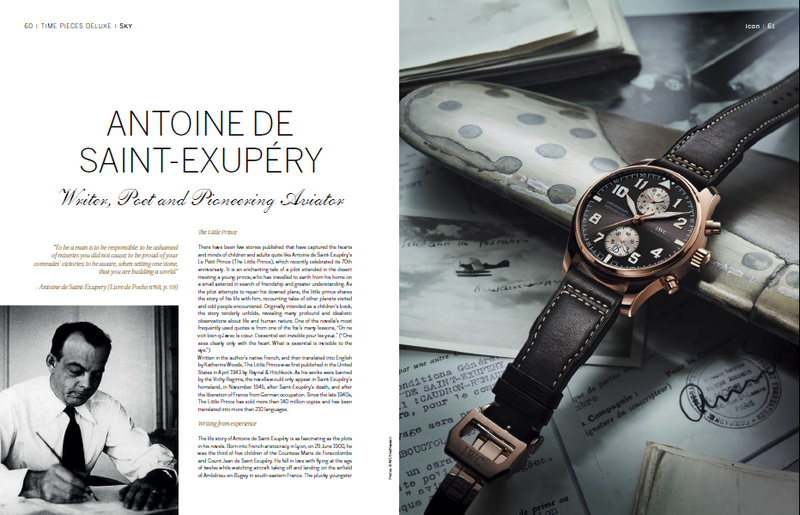 In 2006, IWC launched a special edition of watches honouring Antoine de Saint-Exupéry with the Pilot’s Watch Chrono Automatic, a tribute to the novel Night Flight. In 2007, the Pilot’s Watch Automatic, honouring the gripping Southern Mail, followed, and in 2008 the series continued with the Pilot’s Watch UTC, a homage to his poetic Wind, Sand and Stars. In 2009 and 2010, the fourth special edition, the Big Pilot’s Watch, honoured his outstanding life’s work; it was followed in 2011 with the rarely made Big Pilot’s Watch Perpetual Calendar.In 2012, in recognition of IWC Shaffhausen’s 70-year tradition in the manufacture of Pilot’s Watches and as a tribute to mark Antoine de Saint-Exupéry’s memorable first flight, the company released its sixth special edition in his memory: the Pilot’s Watch Chronograph Edition Antoine de Saint Exupéry. Crafted in 18-carat red gold with a poignant special engraving of a Lightning P-38, the last aircraft he ever flew, embellishes the back of the watch. In 2013 IWC celebrated the 70th birthday of The Little Prince with the launch of two limited special editions: the Big Pilot’s Watch Perpetual Calendar Edition “Le Petit Prince” and the Pilot’s Watch Mark XVII Edition “Le Petit Prince”. Common to all the special editions is that each one has featured a single model in platinum, which has gone up for auction. How the proceeds from the auction are used is decided in cooperation with the Fondation Antoine de Saint-Exupéry for Youth, which ensures that the donation reflects values espoused by Saint-Exupéry.